Chock-full of apples and crowned with a buttery pecan crumble topping, this dessert is a winner in the apple pie category. For Crust: In large bowl, combine flour and salt. Cut vegetable shortening and butter into flour mixture until crumbly. Gradually stir in water, mixing until dough binds when pressed between fingers. Form dough into two balls, one slightly larger than the other; wrap and refrigerate. For Filling: In large pot over medium heat, cook apple slices until just tender and they give up their water—about 12 minutes. Remove from heat and drain well. Add sugar, flour, cinnamon, nutmeg, and vanilla; mix to blend and set aside. For Crumble Topping: In medium-size bowl, combine flour, sugar, and salt. Cut butter into flour mixture until coarsely blended. Add pecans and rub mixture briefly between fingers to form crumbs. Preheat oven to 375°F (190°C) On lightly floured surface, roll out smaller piece of dough to an 11-inch round; fit into 9-inch pie pan allowing excess to hang over edge. 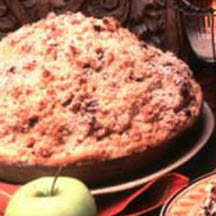 Fill pastry-lined pan with apple filling, mounding in center. Roll out larger piece of dough to 12-inch round; place atop filling to cover. Pinch edges of bottom and top crust together to seal. Brush top of pie lightly with water and gently press crumb mixture on top. Cut several slits in top crust to vent steam; bake 45 to 50 minutes or until crust is golden brown. Cool at least 25 minutes. Sprinkle powdered sugar over top and serve.